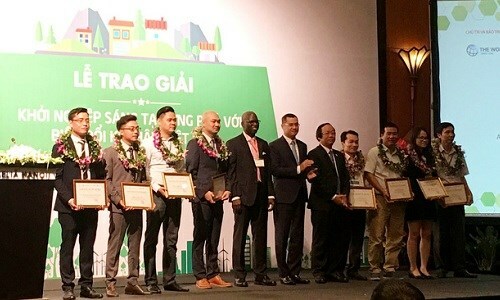 Hanoi (VNA) – Twenty-one startup businesses were honoured at an award ceremony in Hanoi on September 20 for initiatives in response to climate change-related challenges. Of them, 17 received financial and services support while the remaining obtained services assistance only. The organising board also acknowledged efforts of the first seven firms that graduated from incubation lasting one year. Speaking at the event, Deputy Minister of Science and Technology Pham Dai Duong praised startups for standing side by side with the Vietnam Climate Innovation Centre to achieve set goals. He expressed hope that the honoured enterprises would grow further and positively impact economy, environment and society. WB Country Director in Vietnam Ousmane Dione lauded the winners for playing important roles in local economic development and job creation.